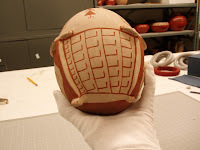 PUEBLO GRANDE MUSEUM BLOG: What's a Pot Ring? PGM’s Maricopa Pottery exhibit “All Good Clay Smells Like Rain” opens on March 4th. The Collections staff has been busy selecting pots and photographs for display. We’ve been working with our exhibit designer to layout the cases and are now in the final stages of preparing for the exhibit. One of the preservation issues with displaying pottery is that many pots have rounded bottoms, are top-heavy or do not sit levelly. This can be a problem in exhibits where cases get bumped or shaken. To prevent pots from tipping over, the Collections staff makes mounts that help the pots sit levelly. For example this 2007 effigy vessel by Dorothea Sunn-Avery has a rounded bottom and appliquéd feet. After testing a couple of different mounts, we decided that the best kind of mount for this vessel is a thin pot-ring that supports the base but allows the feet of the vessel to hang freely. 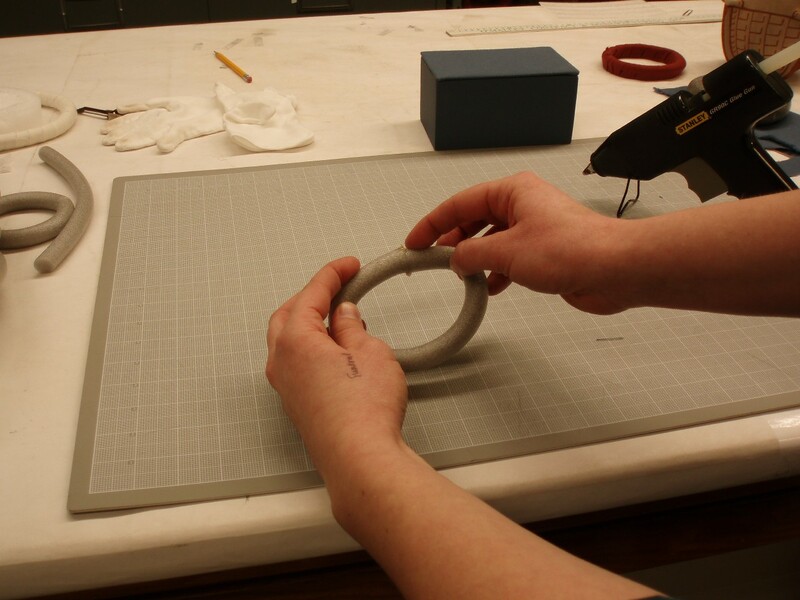 These mounts are some of the easiest and most cost-effective ways to stabilize pottery. 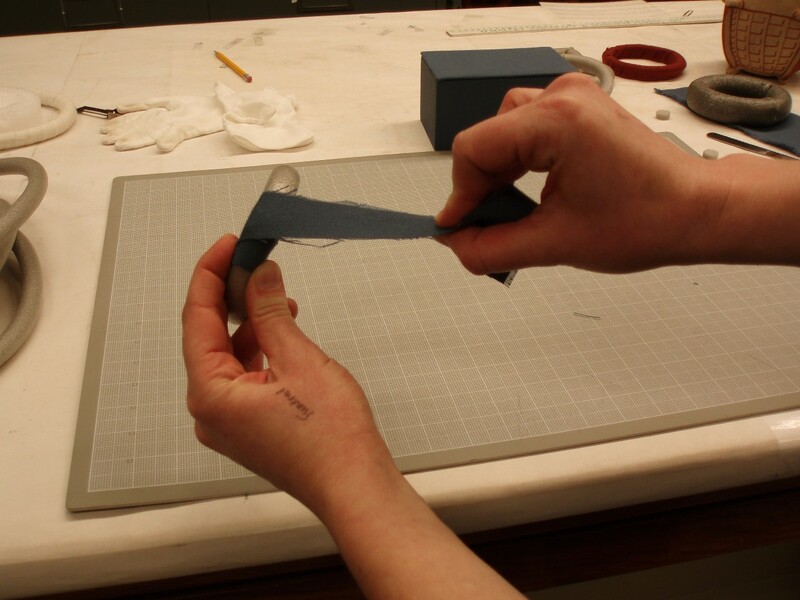 First, we cut a length of closed-cell polyethylene backer rod (the same material used in home caulking projects). Polyethylene is one of the more stable plastics and does not off-gas or decay, making it ideal for use in a museum setting. 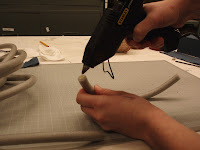 Next, we use a glue gun with hot-melt adhesive to join the ends of the backer rod, creating a ring. 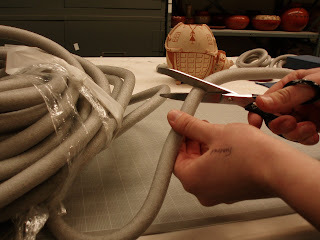 Once the glue has hardened, we wrap the pot ring in the same fabric that will be covering the exhibit cases and lifts. This helps to create a unified appearance in the case and the exhibit, so that the pot rings blend in to the rest of the display. Our final step is the “bump test” where one of our Collections staff scientifically bumps the surface where the pot is resting to make sure that our mount stabilizes the vessel. 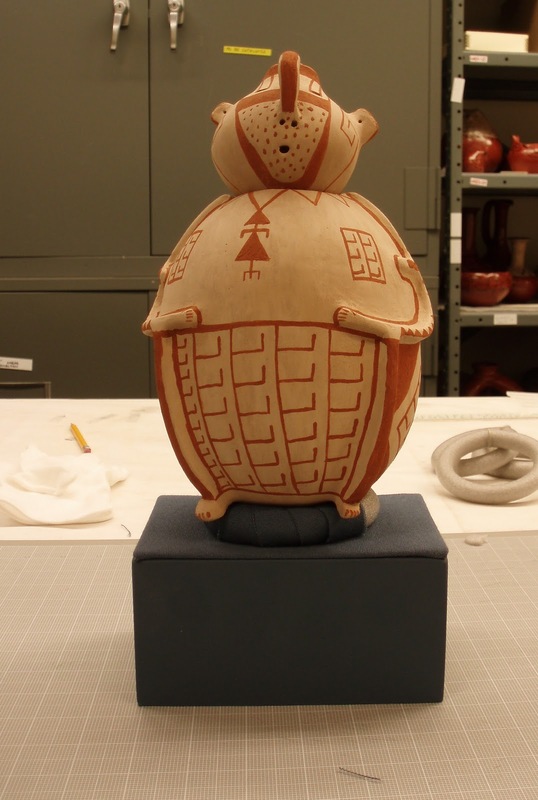 This upcoming exhibit will feature over 100 pieces of Maricopa pottery. 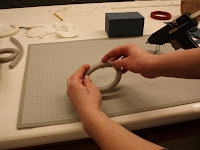 Making pot-rings for the exhibit is only one of the jobs that our staff and volunteers will be busy with over the course of the next month. We enjoyed our tour of the lab with you Thurs., Lindsey. Pot rings are cool! How timely. We just took the "behind the scenes tour" last Wednesday and discussed the pot rings. This further explanation really helps. Good job Lindsey.